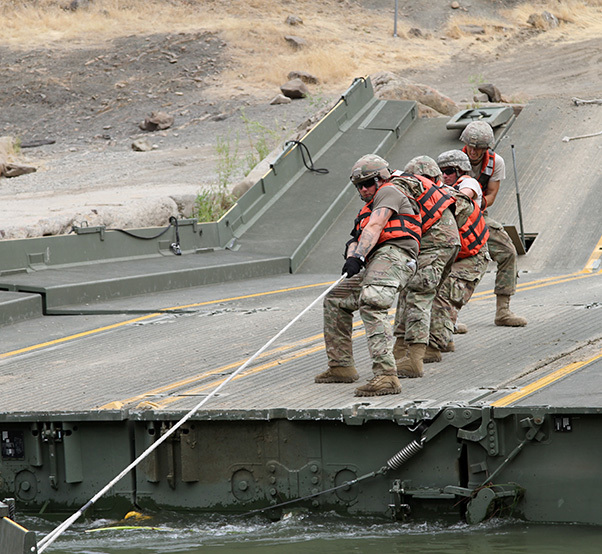 Cache Creek Regional Park, Calif.
U.S. Army engineers from the California Army National Guard’s 132nd Multirole Bridge Company, 579th Engineer Battalion, 49th Military Police Brigade, shift a ramp while dismantling a floating bridge July 14, 2018 at Cache Creek Regional Park, Yolo County, Calif., where the 132nd constructed a temporary floating bridge to support the California Department of Forestry and Fire Protection efforts to battle Northern California wildfires. 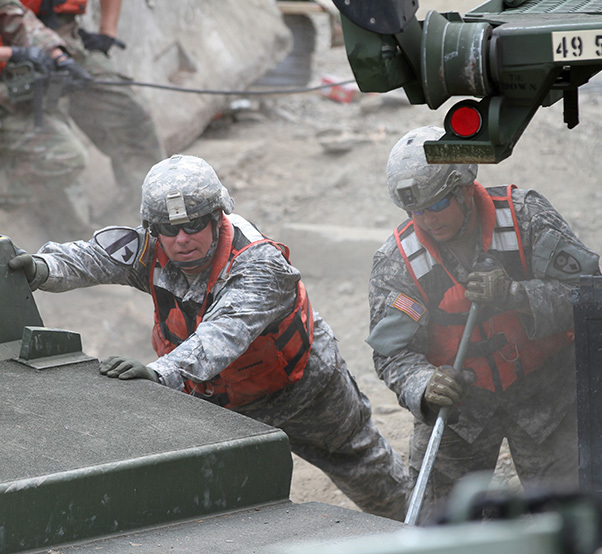 This was a mission about quickness for the California Army National Guard’s 132nd Multirole Bridge Company. First, there was the Pawnee Fire that erupted late June in Lake County, Calif., that scorched more than 15,000 acres. Then the Spring 2 Fire ignited a few days later, but that was extinguished after a modest 80 acres burned. Yet the California Department of Forestry and Fire Protection, or CAL FIRE, stayed busy immediately as the County fire erupted in Napa and Yolo counties, and needed to move its assets quickly to fight the latest blaze. The California Army National Guard’s engineers quickly stepped forward. The Redding, Calif., unit constructed a 100-foot improved ribbon bridge in the same location as they did three years ago for another fire. The “go up the middle” effect allowed CAL FIRE and other California Office of Emergency assets to quickly move heavy equipment and personnel to the wildfire. 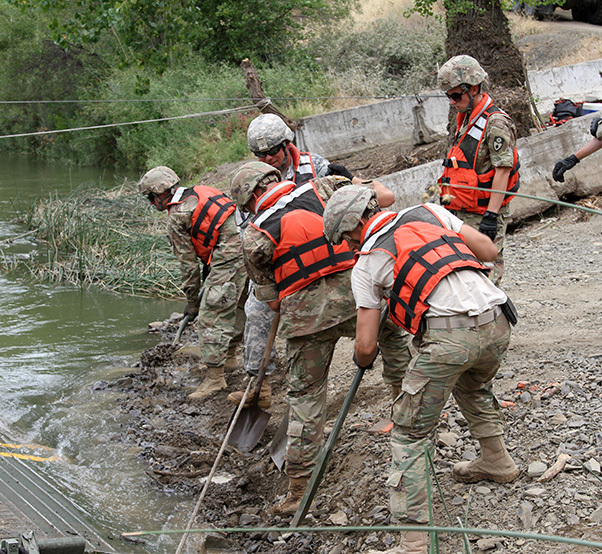 U.S. Army engineers from the 132nd Multirole Bridge Company (MRBC), 579th Engineer Battalion, 49th Military Police Brigade, California Army National Guard, unearth ground to reposition a ramp July 14, 2018 while dismantling a floating bridge at Cache Creek Regional Park, Yolo County, Calif.
Just as it did three years ago, the temporary bridge structure floated adjacent to a permanent concrete bridge that was deemed “zero tons,” according to Steve Sahs, a California Department of Transportation senior bridge engineer/inspector, in his 2015 observation. It’s passable for normal vehicles, but big, heavy equipment such as fire trucks and bulldozers aren’t permitted, Sahs explained. 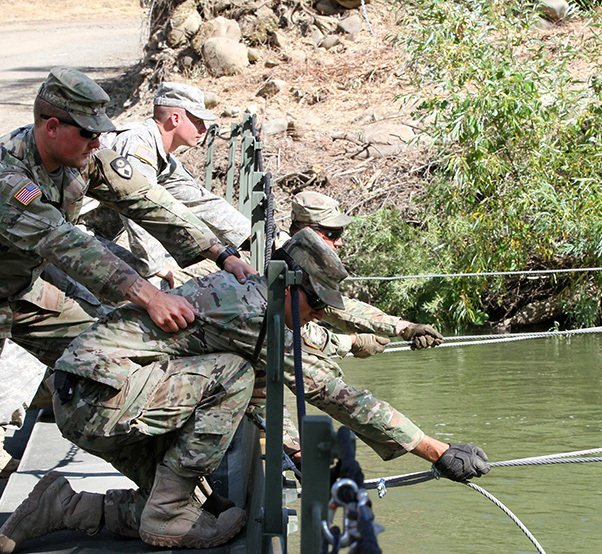 Specialists Christian Berg, Bryce F. Jones, Aaron W. Parker and Michael Fereira of the California Army National Guard’s 132nd Multirole Bridge Company, 579th Engineer Battalion, 49th Military Police Brigade, adjust tension cables that secure a temporary floating bridge July 13, 2018 at Cache Creek Regional Park, Calif. The bridge was utilized for about a week, said 132nd’s Sgt. 1st Class Harley Ramirez. More than 650 vehicles and 1,200-plus personnel crossed it. Ramirez stationed his troops on a 24-hour safety watch. He credited the team for its productiveness, noting how quickly the bridge went up — and down — compared to three years ago. “We had issues working in the tight areas, but this gave us hands-on experience on what to do and not,” said Sgt. Ellie Ogsbury. 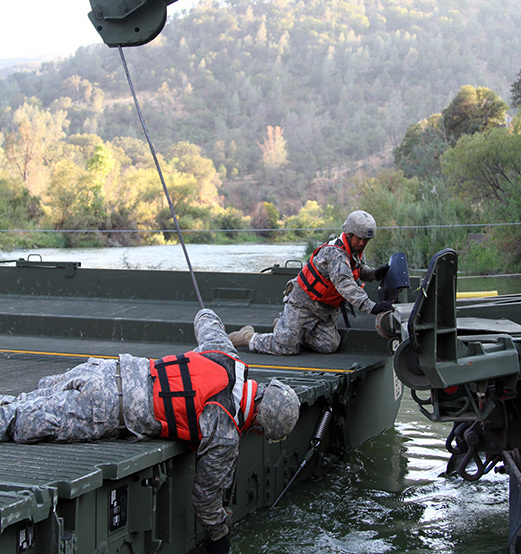 A launch and retrieve team from the 132nd Multirole Bridge Company, 579th Engineer Battalion, 49th Military Police Brigade, California Army National Guard, use a steel guide line to move a ramp and bay over Cache Creek River Aug. 7, 2015, at Cache Creek Regional Park in Yolo County, Calif. The platforms are part of a floating bridge the MRBC constructed to help CAL FIRE vehicles and equipment cross the river to battle the 2015 Rocky Fire and most recently the County Fire. Three years ago the 132nd erected the bridge mainly for CAL FIRE to battle the Jerusalem and Rocky Fires in Lake County. The Rocky Fire (approximately 70,000 acres) was one of the largest blazes that year, second only to the Valley Fire (76,000 acres) that occurred nearby. The 132nd was part of the California Army National Guard’s 49th Military Police Brigade’s units to be activated so far in 2018. The 270th Military Police Company assisted law enforcers during the Siskiyou Fire near the California-Oregon border. More than 500 Soldiers from the California Army National Guard’s 144th Field Artillery Battalion were training for ground operations by mid-July, one of the earliest call-ups for hand crews. The County Fire, the key for the 132nd’s activation, destroyed 20 buildings and injured one. More than 450 emergency personnel responded, with the majority of them using the bridge the Soldiers had built. Dust and dirt fly as U.S. Army Sgt. 1st Class Hanley Ramirez and Spc. Jeff Mann of the California Army National Guard’s 132nd Multirole Bridge Company, 579th Engineer Battalion, 49th Military Police Brigade, work to dismantle a temporary floating bridge July 14 at Cache Creek Regional Park, Yolo County, Calif.
Members of the 132nd Multirole Bridge Company (MRBC), 579th Engineer Battalion, 49th Military Police Brigade, California Army National Guard, “buddy up” to secure a steel cable Aug. 7, 2015 at Cache Creek Regional Park in Yolo County, Calif. 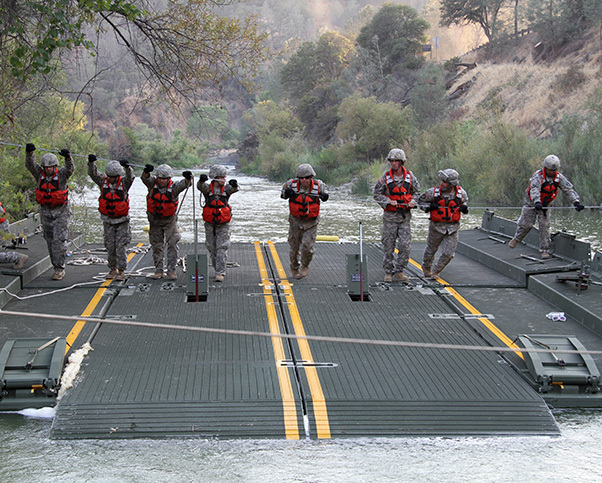 The Redding, Calif., unit was called again (July 2018) to assist the ongoing wildfires in northern California by erecting a temporary floating bridge that will grant CAL FIRE easier access to battle the blazes. Spec. 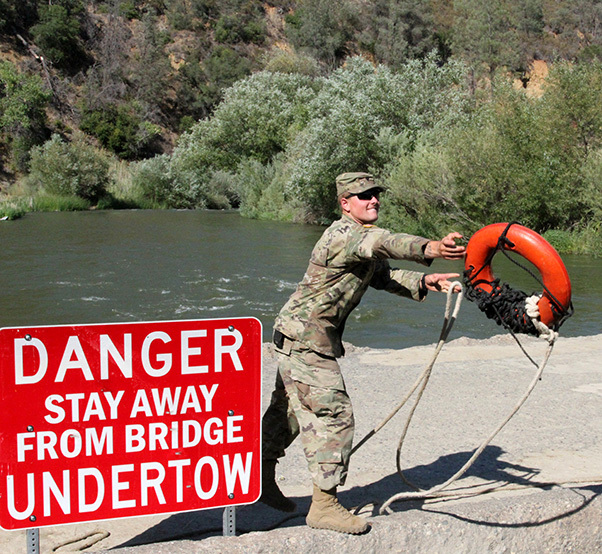 Christian Berg of the 132nd Multirole Bridge Company, 579th Engineer Battalion, 49th Military Police Brigade, California Army National Guard, tosses a floatation device to a teammate July 13 as members of the 132nd secure a temporary floating bridge at Cache Creek Regional Park, Calif. 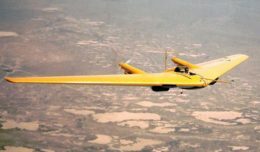 The Guardsmen built the bridge so California Department of Forestry and Fire Protection (CAL FIRE) personnel and vehicles have quicker access to fighting wildfires.